This morning after breakfast, our boat approached the great dam on the Danube built in the 1960’s as a joint hydro-electric project by the governments of Yugoslavia and Romania. Behind the dam lies a sixty-mile-long finger lake submerging what was for centuries one of the most beautiful and treacherous stretches of water in Europe. The Danube narrows precipitously in the gorge between the Carpathian and Balkan Mountains, at times becoming no more than 150 feet wide. 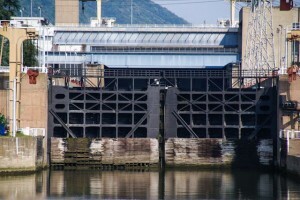 Before the dam was built, the seventy miles of the Iron Gates consisted of rapids, whirlpools, jagged rocks just below the surface of the water, and the constant threat of capsizing. 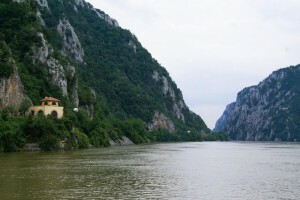 For centuries, writers told hair-raising tales of their passage through the Iron Gates, and river traffic down the Danube generally stopped at Veliko Gradiste (the Roman fort of Punicum) and recommenced southeast of the gorge, after a strenuous overland trek across the mountains. The Roman general Trajan built a road alongside the river to transport his legions and supplies, drilling holes into the rock of the sheer cliffs above the waterline and pounding poles into the holes to support a cantilevered wooden walkway. 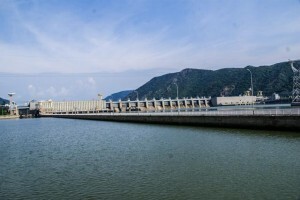 Some of the holes are still visible, although most of them, along with entire villages and many priceless archeological sites, lie submerged beneath the water above the dam. The scenery sailing through the Iron Gate is truly spectacular, reminding many of us of the Norwegian fjords. 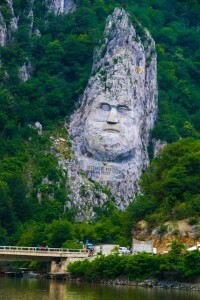 On the Romanian side, near the place where Trajan had a bridge built across the Danube, Europe’s tallest rock sculpture can be seen from the river: King Decebalus, the ruler of Dacia, defeated by Trajan in the second century A.D. No likeness of Trajan parallels it, though, to commemorate his victory. At sunset, we saw one of the most beautiful little castles imaginable, set just above the river on the northern bank. How it escaped being drowned along with the rest of its history we can’t imagine. For more photos of the Iron Gate, click here.